Bristol, TN - $500,000 Guaranteed to Win on Friday Night with a 385 car cap is sure to make for an elite event. The Sparco Fall Fling 500k opens for pre-entries at Noon EST this coming Monday March 5th. Click Here for complete flyer and pre-entry information. Bristol, TN - Rocky Pintavalle wheeled his way through the sea of dragsters with his door car Duster powered by a true Mopar engine and three speed transmission, all of which earned him the distinction of Todd’s Extreme Paint’s MVP Award, rightfully shutting out any of the hundreds of other great racers in attendance. 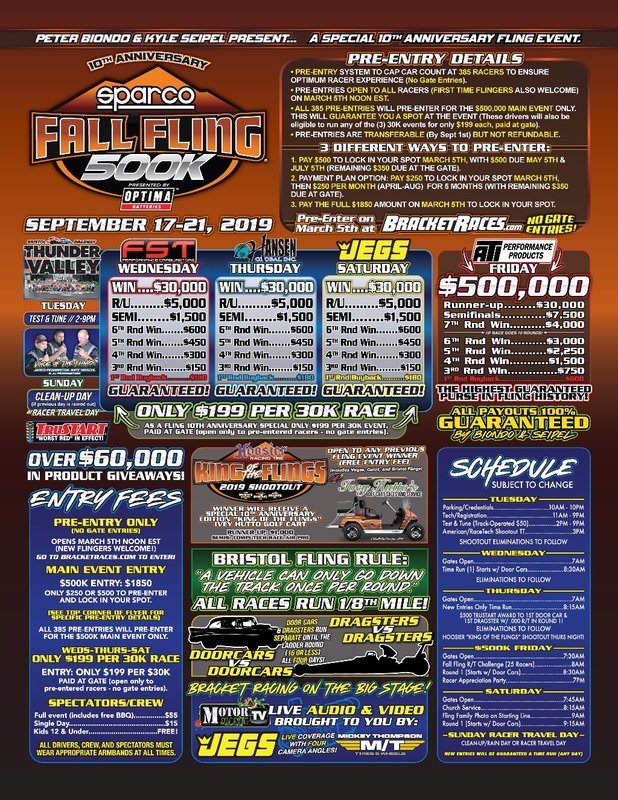 Bristol, TN - Live Coverage from the Sparco Fall Fling continues Friday Morning and runs through Saturday evening at Bristol Dragway in Bristol, TN. Click Here for Live Video and Chat! Live Coverage from the Sparco Fall Fling goes live Tuesday Evening and continues thru the weekend at Bristol Dragway in Bristol, TN. Click Here for live video and chat! 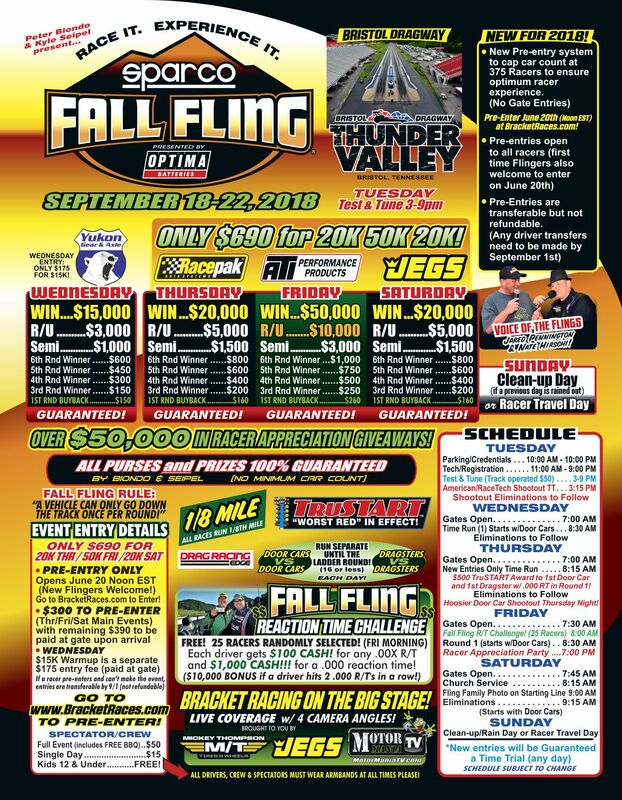 Bristol, TN - Live Coverage from the Sparco Fall Fling goes live Tuesday Evening and continues thru the weekend at Bristol Dragway in Bristol, TN. Click Here for live video and chat! 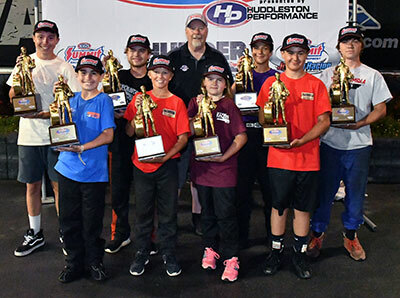 Bristol, TN - Carson Emmett (age 11) won his second NHRA Jr. 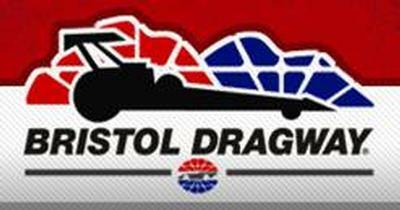 Drag Racing Eastern Conference Finals presented by Huddleston Performance title when the 2018 edition of the annual event at Bristol Dragway wrapped up Friday night. Bristol, TN - Holston, Barnhart, Finchum and Pollard all collect at the 12th edition of the BTE World Footbrake Challenge presented by Yukon Gear and Axle. Click Here for the complete story recap and photos. Bristol, TN - Other Lucas Oil Series winners were Stillings who was out first and held off Ed Longhany Sr. in Stock Eliminator while Furr took home his seventh win in holding off Ray Miller III in Super Gas. Caheely was better at both ends of the track to put Jacob Elrod on the trailer in Super Comp. Glendora, CA - The NHRA Jr. Drag Racing Conference Finals will return to familiar surroundings for the 2018 season as the Western Conference Finals will take place at Osage Tulsa Raceway Park in Tulsa, Okla., and the Eastern Conference Finals will be held at Bristol Dragway in Tennessee. Bristol, TN - In the semis, McCarty fouled away his chances with a -.001 red-light. Unfortunately, York hurt his engine on that run and was unable to return for the final to give the newly crowned IHRA Top Dragster world champion Williams a $50,000 payday to add to his resume of wins.